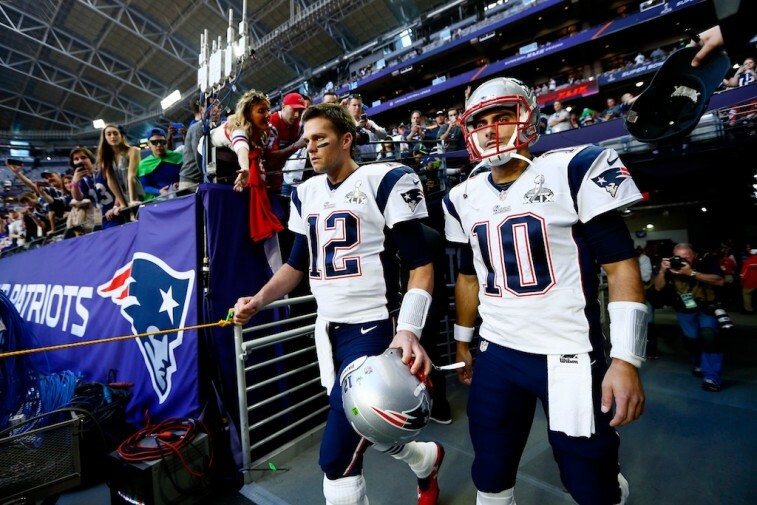 NFL: Who the Hell is Jimmy Garoppolo? The New England Patriots are still Tom Brady‘s team. Anyone who questions that, even in light of recent events, is in serious need of a wakeup call. That doesn’t change the fact that the Super Bowl champs got sacked hard on account of Deflategate. If the Pats hope to defend their title, they’re going to need some help from an unlikely source: Jimmy Garoppolo. Exactly. You most likely don’t know the name. How could you? It’s not as if he spends much time on the field during Patriots games. But he’s there on the sidelines, waiting in the wings, looking for that golden opportunity to strut his stuff and prove that he’s more than just a backup quarterback. Now it would appear that time has officially come, albeit a bit sooner than most expected. Not unlike the last quarterback thrust into the New England starting gig by inauspicious events. 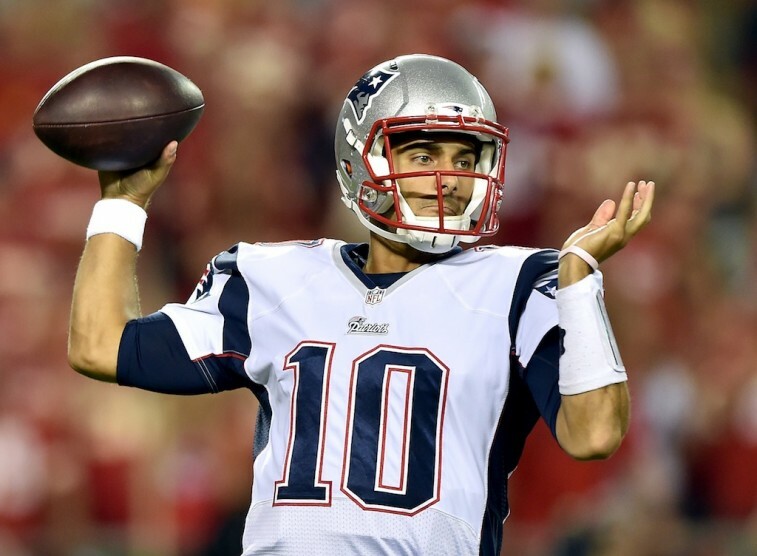 With Brady currently suspended for the first four games of the year for his involvement in Deflategate, Garoppolo is most likely the starter heading into Week 1 of the 2015 season. Can he handle the pressure? Let’s find out. In his rookie season last year, Garoppolo managed to get onto the field during six different games. Unfortunately, the sample size is severely limited. The 6-foot-2 quarterback only threw the ball 27 times, completing 16 passes, for 182 yards and a touchdown. That noted, the Patriots had to have seen something special in the 23-year-old. If not, there’s no way they would’ve used a second-round draft pick (No. 62 overall in 2014) on him. And if you look at what he did during his four years at Eastern Illinois, the numbers tell the story: This kid can play. Garoppolo showed his potential not because he was a star right away, but rather because he displayed the ability to improve with time. It’s rare that a quarterback enters the NFL completely polished; it’s important to be able to learn and develop as a passer. In his four collegiate seasons, Garoppolo did just that. While his completion percentage was under 59% at the start of his college career, that statistic, among others, rose significantly by the time he was a senior, in 2013. That year, Garoppolo completed 66% of his passes, including throwing for 5,050 yards, 53 touchdowns, and just 9 interceptions. This output was enough to get people’s attention. And now he’ll have the chance to do it all over again for the Patriots. Here are some important facts to think about: Brady is 37 years old. He may still have a few great years of football left in him. But eventually, he’ll have to call it a career, and the Pats better have a suitable replacement ready to fill the void. The organization took Garoppolo with a second-record pick in 2014 — that says a lot. It says that they believe he could be the quarterback of the future. Now they’ll get to see if they were right. If you didn’t know much about Garoppolo before, that’s all about to change. Welcome to the spotlight, No. 10. For the time being, you’re the starting quarterback for the New England Patriots. The stage is yours. All statistics are courtesy of Pro-Football-Reference.com and Yahoo Sports.